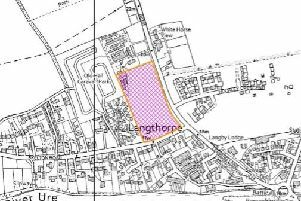 A controversial plan to raise the ground level of a planned 184-dwelling development at Boroughbridge has been approved. Planning committee councillors first gave the stamp of approval for the Greystones development in August last year, but it returned this month with an alteration to raise ground levels in order to fit in a gravity-fed drainage system. Prior to the meeting this month, a petition signed by 104 people who lived near the site and were against the raise, which will be up to 2.5m in parts, was submitted to council. Harrogate MP Andrew Jones also submitted a letter asking the planning authority to consider the impact of the raise on residents of The Chase nearby. Among their concerns were that the increased ground levels will result in increased flood risk and drainage problems in an area already impacted by flooding, and that properties along the western boundary would be "overlooked and overshadowed". In response, a council officer said told the committee that the maximum raise of 2.5m related to only 19 properties of the 184. The most concern about overshadowing related to properties on the western boundary, which would be between 1.6 to 2m. Coun Robert Windass, the ward member for Boroughbridge, also raised concerns from residents who feared ground stability would be impacted in backyards bordering the development. “I'm not a nimby, I have been contacted though by residents of The Chase who are very concerned about the height of their garden and the stability when (the applicant) starts building,” he said. A representative of applicants Taylor Wimpey said that existing land levels at the sight were naturally lower and would help negate the rise, with the maximum rise not proposed for any sites on the western boundary. She added that the applicants planned on "opening and maintaining dialogue" with neighbouring residents, and that "they do not propose that the work will have an impact on ground stability", with the variation then approved by councillors.